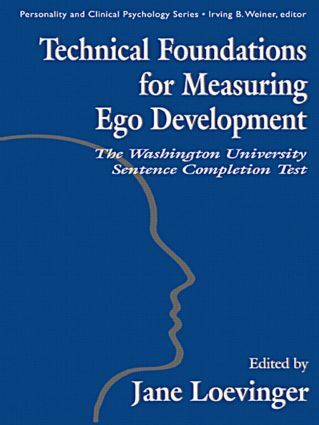 This book describes the evolution of the Washington University Sentence Completion Test (SCT), a major measure of ego development, from an intuitive rating scale to an empirically derived reliable and valid personality test. The authors recount the complete history of the SCT, which begins with the Family Problems Scale, an objective test of mothers' attitudes. Work with that test led to a concept of ego development, testable by the SCT, which was elaborated and refined in further work. The book discusses uses of the SCT in other languages and other cultures, offers suggestions for giving the SCT in translation, and presents computer programs for handling SCT responses. Data on reliability and validity of the SCT are brought up to date. These include evidence of the equivalence of the male and female forms of the current version, Form 81, and the equivalence of the two halves of Form 81, each usable as a short form. Rules for obtaining total protocol ratings for 18-item as well as 36-item forms are given. Frequently used forms of the SCT, including a new form for adolescents and children over eight years old, are presented. Contents: J. Loevinger, History of the Sentence Completion Test (SCT) for Ego Development. J. Loevinger, L.D. Cohn, Revision of the SCT: Creating Form 81. J. Loevinger, L.X. Hy, K. Bobbitt, Revision of the Scoring Manual. L.X. Hy, K. Bobbitt, J. Loevinger, Testing and Revising the Rules for Obtaining TPRs for 36-Item and 18-Item Forms. J. Loevinger, Reliability and Validity of the SCT. L.X. Hy, Managing SCT Data. J. Loevinger, V. Carlson, P.M. Westenberg, H. Lasker, Ego Development as a Stage-Type Theory and a Process. V. Carlson, P.M. Westenberg, Cross-Cultural Applications of the WUSCT. J. Loevinger, The Place of the WUSCT for Ego Development in Personality Measurement. P.M. Westenberg, P.D.A. Treffers, M.J. Drewes, A New Version of the WUSCT: The Sentence Completion Test for Children and Youths (SCT-Y). J. Loevinger, L.X. Hy, Other Uses of the WUSCT. Appendices: J. Loevinger, K. LaPerriere, C. Ernhart, The Family Problems Scale as a Measure of Authoritarian Family Ideology. J. Loevinger, V. Carlson, L.X. Hy, Notes on WUSCT Rating Practice Exercises (Provided in Appendices A and B of Hy & Loevinger, 1996). Current Version of the WUSCT (Form 81 for Women and Men) and Previously Used Forms for Adults and Children. Excel Macros for Handling SCT Data. K. Bobbitt, L.X. Hy, J. Loevinger, Rule for Locating Categories. L.X. Hy, How to Use the SCT in Translation.